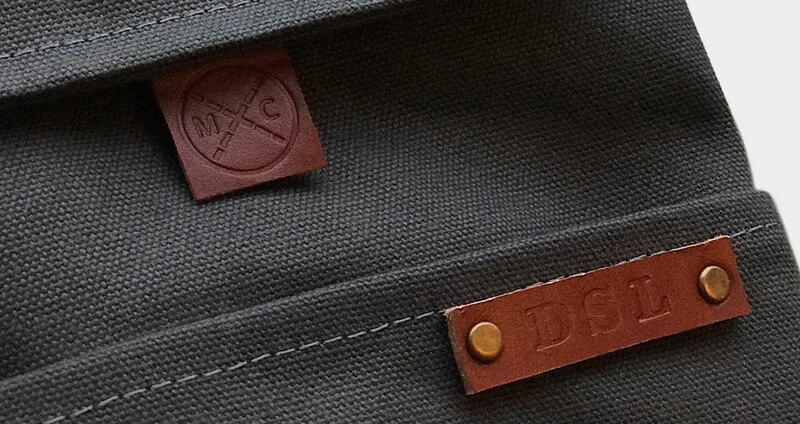 We use premium quality waxed canvas and leather for all our sleeves and cases. These natural materials are very durable, long-lasting and age nicely over time. This is a beautiful, heavy-duty cotton canvas that is treated with a natural layer of a proprietary blend of wax. It creates a surface that is smooth and water resistant. Unlike fully waxed canvas, this fabric won’t have a wrinkled or “cracking” effect with use. The colour won’t rub off or transfer onto your clothing or other materials and it’s dry to the touch (some waxed canvas materials feel a little “waxy” or damp to the touch). This is a special textile that is produced by a small, family-run business in the U.S.A. since the 1830’s. They are one of the last companies to produce this kind of quality material. The leather that we use is hard-wearing, thick and strong. It’s a top grade quality leather that ages beautifully. The leather is smooth on both sides and has a nice flexibility for use as pull tabs, straps and as a stamped label for personalization. We use only solid antique brass hardware for our attachment points. While this is more expensive than most other types of hardware on the market, it is not only stronger, but more durable as well–extra important for keeping your keyboard safe and secure inside its sleeve or case. The magnetic snaps we use are of the heavy-duty variety and require just enough force to open while strong enough to stay closed as needed.